Posted by Jon in NECA with 1 comment. This past summer NECA had some Toys “R” Us exclusive sets of figures from their various lines. This fall/winter they are doing it again with a whole new bunch of figures. You may or may not know this but I am a pretty big Prometheus fan, I love the movie and love what NECA is doing with the figures. 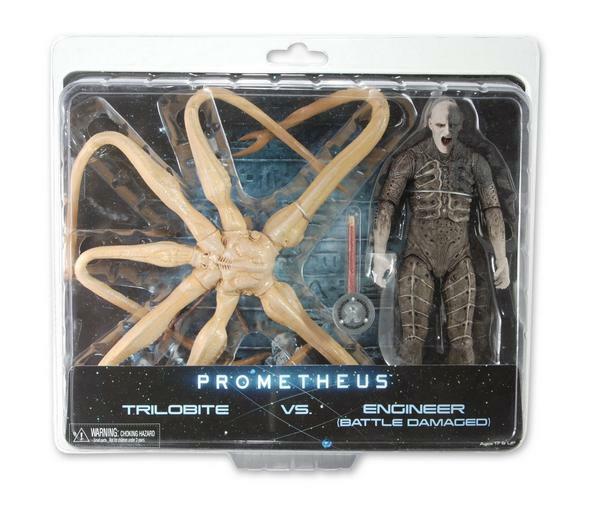 Prometheus is one of the properties getting a TRU exclusive. In addition to Prometheus, NECA will also have exclusives from Assassin’s Creed, Rocky, Gears of War, and Predator. Let us start off with the one I am most excited about: Prometheus. This two-pack will include the Trilobite (that squid like thing Shaw had to abort from her body) and a battle damaged Engineer. This is the engineer that they found was still alive and Weyland attempted to talk to, if you saw the movie you know it didn’t end well. This looks to be the only way you will get the Trilobite, so it will probably be a pretty popular set. Plus you get the pressure suit in black … now just need to hope for an Engineer in his briefs from the beginning of the movie, and the beginning of human kind. Next up is a Gears of War “Best of” assortment of figures. 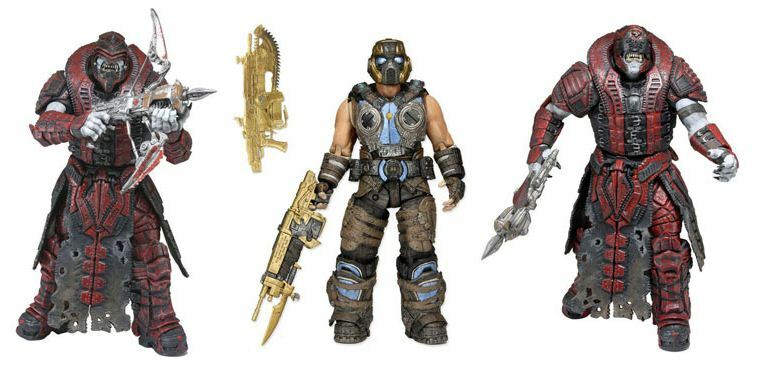 This is basically taking some of the best Gears of War figures and giving them some new game accurate details. The assortment includes the COG Soldier and two Theron Sentinels. The COG soldier will have gold highlights on his helmet, and he will come with two gold lancers. The Theron Sentinels will be red, and each will feature a unique helmet. This is a great assortment for those that like to army build. 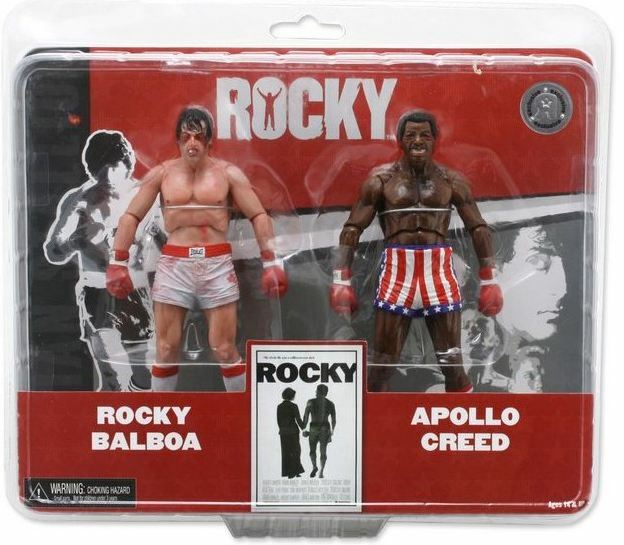 Continuing in the two-pack tradition, NECA will be doing a Rocky vs. Apollo Creed exclusive. This will include battle-damaged Rock and Apollo using the new skin technique they started in the second series. It’s great to get these two in a pack together, but it also helps then blend with series two and on. On to Assassin’s Creed. If you are the type of guy who can’t get enough Ezio, NECA has your number and is about to pump two more into your collection. 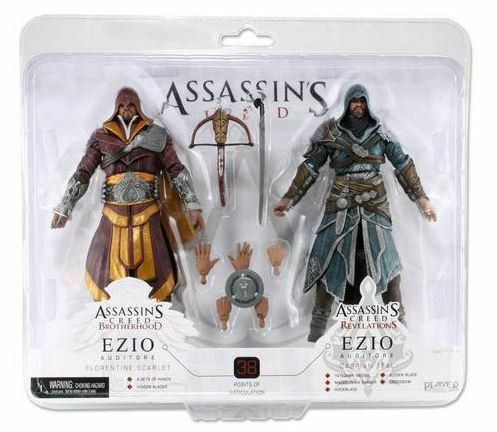 This two-pack based off of the Assassin’s Creed: Revelations and Brotherhood games, they are both Ezio in unlockable colors. The pack comes with a gaggle of extra hands and weapons. 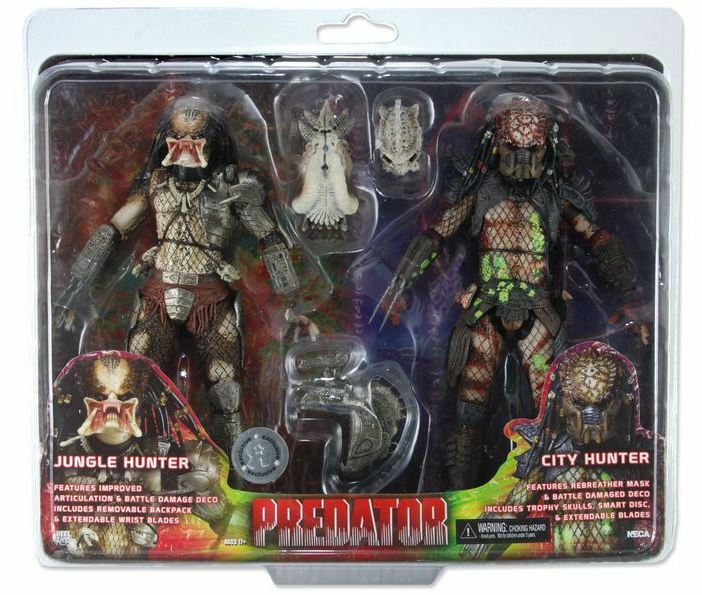 Finally we get to the Predators, and this pack is quite a doozie. You have representation from the first and second movie with the Jungle Hunter and the City Hunter. This set also include two more trophy skulls to add to the lost tribe’s trophy wall. Now that the lost tribe is complete we are going to need to gather all those skulls and release a wall. I believe they may have one more reveal, but this should be the bulk of the NECA TRU exclusives for the fall and holiday season.